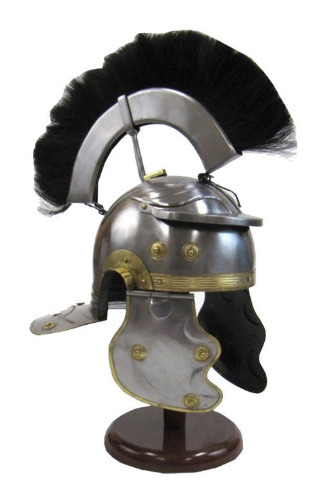 Thick, 18 gauge carbon steel is used for the durable construction of this Roman Imperial Centurion Helmet. Horse hair is used for the 7 inch tall plum, dyed black. Carbon steel is contoured to the authentic shape of the historical helmet. Layered steel adorns the top. A movable steel visor is fixed to the front. Around the sides are brass decoration rivets to signify status. The bottom edge of the Roman Imperial Centurion Helmet is trimmed with brass all the way around. At the back is a carbon steel neck shield designed to fit over a gorget. Each side of the face is further protected with a hinged shielding. Stand not included.